The Napolino pizza oven series feature a traditional Naples-style ventilation system, where hot air exhausted from the oven is routed back over the oven dome and then vented through a vertical stainless steel chimney pipe in the center of the oven. This ventilation method helps evenly and efficiently heat the oven dome, as well as help the oven maintain the high temperatures required for baking Pizza Napoletana. The Napolino outdoor pizza oven is the right choice for homeowners who do not have the space, but want a high end custom made authentic Italian style pizza oven. Capable of baking up to 30 pizzas per hour, it can feed all families and most parties. Competitively prices and made in the USA, the Napolino outdoor pizza oven is a great value. The Napolino outdoor pizza oven series is a Naples-style fully assembled oven designed for backyard baking. This beautiful and innovative pizza oven features the traditional center vent and beautifully tiled enclosure found in pizzerias in Naples (and around the world), in an oven sized for home pizza making, baking and roasting. The name Napolino, an affectionate, diminutive version of Napoli, says it all. The Napolino wood fired pizza oven provides the industry’s fastest heat-up times (20 minutes) and excellent heat retention. This makes it easy to cook authentic wood fired pizzas in under 2 minutes. The Napolino ovens feature a beautifully tiled enclosure sealed for outdoor use, along with an optional stand that is powder coated to be weather-proof, rust-proof, and attractive. 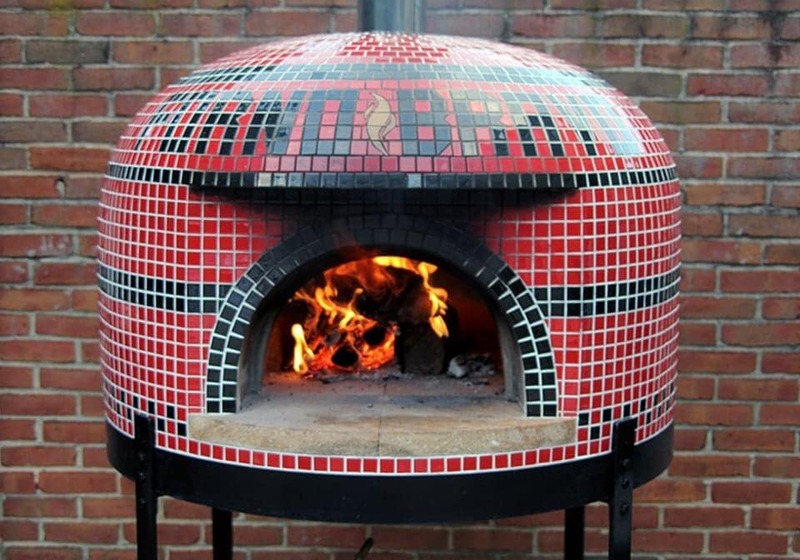 These beautiful wood fired pizza ovens can be custom tiled just for you. The oven has a mono-block dome and integral vent design with zero seams. This is why the Napolino ovens have excellent heat retention and cooking performance, and much better durability than other small outdoor pizza ovens. Naples style center-vent that re-uses heat from the oven and distributes it above the dome. This leads to the best heat retention of any of our commercial pizza ovens. the Napoli recovery time leads the industry.